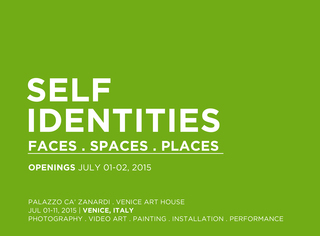 The openings of the event will be on July 01, 2015 at Palazzo Ca’ Zanardi, and on July 02, 2015 at VENICE ART HOUSE Gallery, starting from 06.00 PM (free entry). SELF IDENTITIES – Faces . Places . Spaces is part of SELF festival, organized in Venice at Palazzo Ca’ Zanardi and Venice Art House, from the opening day of Venice Art Biennale (May 09, 2015), with a rich program of different events until November 2015. For the first time in Venice we will give audience the possibility to have private meetings with artists, to meet them personally and share their art and experience. Each event will have a strong program of video art screenings and premiers, art residencies, talks, workshops, live dj set, live experimental dance and art performances.